By Adrian Oliver, Margots in Padstow. 1 baking potato, peeled and diced. Gently sweat the onion, fennel, celery, garlic, fennel seeds, saffron and diced potatoes in the oil and butter for 5 mins. Season with salt and cracked black pepper. Add the white wine and simmer for another 5 mins. Add the double cream and milk and simmer until the potatoes are just cooked. 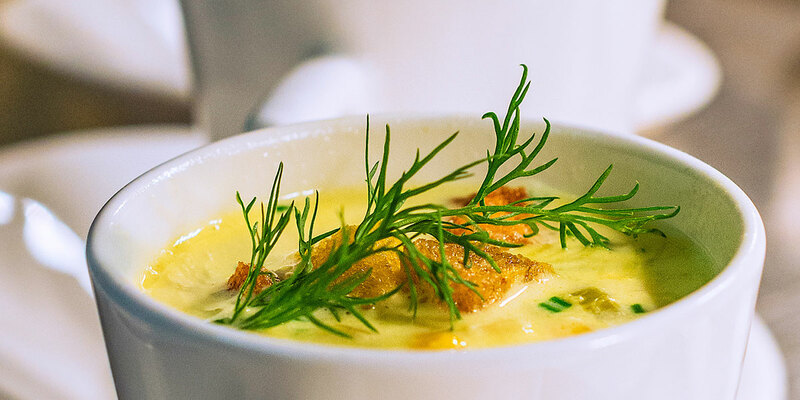 Then add the smoked haddock in large pieces and gently poach in the chowder until just cooked. Stir occasionally to gently break the fish up. Correct the seasoning as you go. Serve with croutons, chopped chives or dill sprig. One of those dishes that can actually be better reheated the next day.